Jürgen Grau, the inventor behind the IN-12 Nixie clock I reviewed a few weeks ago, has a new clock kit on the market. This one is based off of six discreet IV-12 type vacuum fluorescent tubes. The tubes are illuminated from underneath with RGB LEDs whose color, brightness, and cycling pattern can be changed with the push of a button. The enclosure is a professional Plexiglas design that gives the clock a more polished feel than any other VFD clock I have encountered. One of the Facebook users commented that Jürgen’s IN-12 clock possessed a unique combination of hardware and software that made his Nixie clock stand out from other designs on the market. I fully agree with that statement and this applies to his IV-12 design. The two second review: This clock is a winner. Before I start any review, I like to use the clock for a week, to play with its options and to see how it performs over time. After playing with this device for several days I discovered the one thing that really makes this clock stand out from the others on my desk: it is the vibrancy of the led base lighting. The clock is composed of six layers (excluding the PCB), the top three of which are clear. The Plexiglas case allows for the vibrant colors to show through undiffused. This, paired with the nature of LEDs yields a surprisingly nice effect. My camera cannot accurately capture the colors produced by this clock. While the colors in the photos look fully saturated, the actual LEDs are much more vibrant in real life. The case provides a solid and attractive foundation for the clock. The acyclic layers allow for viewers to see through to the PCB and to read the markings on the board and on the components. Every electronics fan likes to see what is inside a gadget and this design allows you to do that. All of the buttons are on the top of the enclosure. The front three are used for setting the time, changing display characteristics and setting other functions. The button behind the tubes is used to turn the base lighting on and off as well as to set the display pattern. To cycle through the color patterns, simply double click the button behind the display. There are markings visible on the PCB if you forget which button this is. Additionally, on the back of the user manual is a chart showing the different patterns along with a brief tutorial on how to change the patterns. There are a few other LEDs on the clock. There are two LEDs that act as as colons in the readout and one last that acts as an alarm indicator. The display is based off of IV-12 tubes. I want to point out something important: these tubes are removable. (For more information on how VFD tubes work, refer to the bottom of this review.) They are almost identical to IV-11 tubes except that these have sockets. There are other VFD tube clocks on the market that use IV-11 tubes but the major advantage of the socketed IV-12 tubes is that they are easily removable. This is a strong selling point for this kit. When a tube eventually breaks or wears out, it will be much easier to replace than if it were soldered to the board. Lastly, at the time of this review, IV-12 tubes can be purchased for a little over a dollar a piece. The digits fade smoothly between values. This clock offers 10 fade speed levels ranging from none (0) to fast (9). Generally, I prefer to use this effect at full brightness or not at all when dimmed. When dimmed, the effect causes a slight flicker in some of the segments. Lastly, the display offers a night time dimming mode. This allows the user to specify a time at which the display brightness dims or is turned off completely. This is set by menu options 13 and 14. 13 sets the time for the dimming to commence and 14 sets the duration of the dimming or display blanking. Option 12 is used to set the dimmed brightness from off (0) to full power (10). As a kit, the assembly is pretty straight froward. As mentioned above, the estimated time to build this device is about three hours. All of the components are clearly labeled and grouped logically in plastic bags to ease assembly. Jürgen provides a nice color coded map of the PCB to allow for quick placement of the components. Once the PCB is assembled, the other major remaining piece is to assemble the enclosure. The enclosure is made up of of 5 plastic pieces stacked on top of each other to build the enclosure. The top three layers a clear while the layers below the PCB are black. Assembling the enclosure is simple if you follow the steps in the manual. Like on Jürgen’s IN-12 clock, the manuals on this device are great. They are divided in to the Owner’s Manual and the Assembly Manual. The Owner’s Manual is twelve pages long (at the time of this writing) and features a clear, color coded layout to help you perform common tasks such as setting the time, changing the LED colors, etc. On the back of the manual is a simple diagram of the built in color schemes. All of the clock functions are clearly laid out in the manual and common use cases are presented. The simple menu structure on the clock and the clean manual layout make setting this clock a breeze! The Assembly Manual details the steps for building the clock and provides helpful hints and photos to ensure a successful assembly. In addition to the text instructions, Jürgen includes numerous photos and diagrams to assist in assembly. The estimated time for assembly is about three hours. I currently have several nixie clock, numitron clocks, and VFD clocks on my desk. Of all of them, this one draws the most attention from my guests. Alarm: adjustable time, snooze and tone. Time format: 12- or 24 hour mode. Display: time / alarm / date / or alternating time - date. Effects: scrolling date, display fading, digit cycling in different styles. DC Power consumption: ca. 7VA (Full tube and LED brightness). The device consists of a hot cathode (filaments), anodes (phosphor) and grids encased in a glass envelope under a high vacuum condition. The cathode is made up of fine tungsten wires, coated by alkaline earth metal oxides, which emit electrons when heated by an electric current. These electrons are controlled and diffused by the grids, which are made up of thin metal. If electrons impinge on the phosphor-coated plates, they fluoresce, emitting light. Unlike the orange-glowing cathodes of traditional vacuum tubes, VFD cathodes are efficient emitters at much cooler temperatures, and are therefore essentially invisible. The principle of operation is identical to that of a vacuum tube triode. Electrons can only reach (and "illuminate") a given plate element if both the grid and the plate are at a positive potential with respect to the cathode. This allows the displays to be organized as multiplexed displays where the multiple grids and plates form a matrix, minimizing the number of signal pins required. In the example of the VCR display shown to the right, the grids are arranged so that only one digit is illuminated at a time. All of the similar plates in all of the digits (for example, all of the lower-left plates in all of the digits) are connected in parallel. 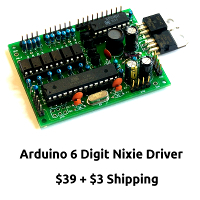 One by one, the microprocessor driving the display enables a digit by placing a positive voltage on that digit's grid and then placing a positive voltage on the appropriate plates. Electrons flow through that digit's grid and strike those plates that are at a positive potential. The microprocessor cycles through illuminating the digits in this way at a rate high enough to create the illusion of all digits glowing at once via persistence of vision. Several amateurs have experimented with the possibilities of using VFDs as triodes. Lastly, if you have any questions, post them in the comments and I will try to answer them for you! Well, this kit is the next one up in the giveaway starting mid-October! Unfortunatelly the price is too high for me. But - maybe i win this kit?? I was wondering if there was a way to purchase this clock kit for my boyfriend to assemble for christmas. I didn't see any links or anything and was wondering if it was for sale. I was wondering if I can still get this IV-12 kit at Nixiekits.eu. I can't find them on there site. How can I get the goods NixieKits.Eu IV-12 costs 159 € (http://www.tubeclockdb.com/vfd-clocks/190-review-nixiekitseu-iv-12.html), paying for it through mastercard delivery to Russia Moscow? How much will this set along with the shipment?